Today we announced an exciting twist to our competition to award a place on Leg 6, the 5,600 mile Pacific Ocean race in the Clipper 2015-16 Round the World Yacht Race. Competition finalists Heather Thomas, 19, from Otley, North Yorkshire, and Charlie Stannard, also 19 from Tower Hamlets, London had been on their Level 1 Clipper Race sail training week on the Solent and were expecting to return to shore today to be told which one of them been selected for the coveted race experience. However the pair were met by Sir Robin Knox-Johnston and Nicholas Harrison, Andrew Simpson Sailing Foundation Trustee, to receive unexpected news that thanks to the generosity of the Clipper Race, both of them would actually be going to take part in the race. 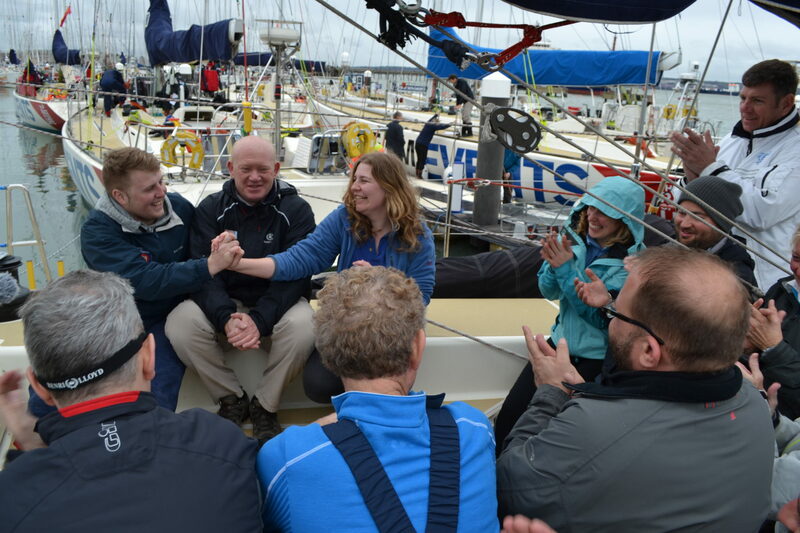 Sir Robin Knox-Johnston explained: “The Andrew Simpson Sailing Foundation ensures young people are given their best opportunity to achieve their potential through sailing so I am very pleased to support their hard work and award both Charlie and Heather with a place on Leg 6 of the Clipper 2016-16 Race. Each Leg 6 prize is worth more than £10,000. Literally the chance of a lifetime, the pair will receive full Clipper Race training and protective Henri Lloyd foul weather kit, flights to Qingdao, China and home from West Coast USA, as well as the full crew member experience on the longest and arguably most challenging leg of the famous race. The Clipper 2015-16 Race starts next August and will be the tenth edition of the world’s longest ocean race, also known as one of the toughest endurance challenges on the planet. The only event of its kind in the world for amateur sailors, twelve team’s race against each other on board the world’s largest matched fleet of Clipper 70 ocean racing yachts. The overall route is 40,000 nautical miles long and includes up to 15 individually scored races, covering six continents. The Pacific Ocean leg of the Clipper Round the World Yacht Race is 5,500 miles long and will take approximately one month to complete. Starting in Qingdao, China in March 2016, and ending in the West Coast of the USA, the Pacific is the world’s largest ocean. Crew members will be trained to encounter Mother Nature’s toughest, yet most exhilarating conditions, including towering waves, howling winds, and high speed surfs.